The recent approval of the Enbridge Northern Gateway pipeline by National Energy Board and the Canadian Environmental Assessment Act review panel has brought a renewed flurry of attention to the project. The media here in Canada has run several stories in recent weeks discussing what the approval means for the pipeline and what if anything can be done to appease those who oppose the pipeline. These discussions, while interesting, focus on the wrong issue and completely ignore what really matters. Even on shows like CBC’s As it Happens and The Current, which normally do a very good job of picking out the crux of complex, nuanced issues, have focused on the potential for spills while completely ignoring the larger issue of climate change. On and on go the discussions about the potential risks of a spill and the many ways the Enbridge pipeline could be made to mitigate those risks. Many people said the project would lead to increased greenhouse gas emissions and other environmental and social effects from oil sands development. We did not consider that there was a sufficiently direct connection between the project and any particular existing or proposed oil sands development or other oil production activities to warrant consideration of the effects of these activities. the core argument for additional pipelines from Alberta has been to encourage economic expansion, via increased operations in the oil sands. If the panel is correct, and the Northern Gateway pipeline would not lead to any further oil sands development, then why build the pipeline? 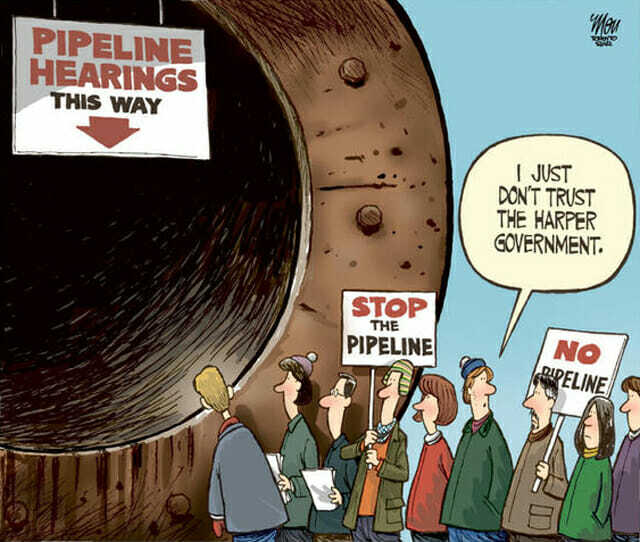 Either the panel is wrong, or the case for the pipeline is wrong. Which is it? The mandate of the joint review panel ensured that it focused on risks which can be mitigated without harming the pipeline or the prospect of future of oil sands development while ignoring the larger risks that can’t be so easily mitigated. An oil spill would be locally devastating, just ask the people living near the Enbridge spill in the Kalamazoo River, and given the difficulties of cleaning up dilbit a spill it could take years to be fully cleaned up. To the communities in the path of the pipeline this is a large risk, and it shouldn’t be minimized. But unmitigated climate change would be globally devastating. The risks wouldn’t be limited to those communities in the path of the pipeline, everyone, from the Prime Minister of Canada, to a poor garment worker in Bangladesh would be affected. And while a dilbit spill might take years, or even decades, in a worst case scenario, to clean up we would be stuck with the consequences of climate change, for hundreds or thousands of years. Compared with the risks posed by unmitigated climate change, even the largest dilbit spill would be orders of magnitude less devastating. If we really care about the environment, all of it, not just the bit in the path of the pipeline, we need a strategy that puts the focus on the climate, and not on spills. If we focus on spills, with a lot of work and a little luck we might stop a pipeline here or there, but the fossil fuel industry will continue to expand. As long as the atmosphere remains a free dumping ground for carbon pollution there is simply too much money to be made in digging up fossil fuels and selling them to people (like me and you) who want to burn them. Ultimately the risks of a burst pipeline spewing forth hundreds of thousands of gallons of dilbit can be mitigated. Sophisticated and rigorous inspection polices to ensure that weak spots in the pipeline are detected before the pipe fails. Removing liability caps to ensure that Enbridge is forced to pay for any issues caused by the pipeline and requiring than they have enough cash set aside, or have enough insurance to be able to afford to fully clean up any potential spill and compensate anyone affected. Policies such as these can serve as effective mitigation (but not elimination) of the risks associated with a pipeline. Mitigating the risk of spills is the most likely outcome of an anti-pipeline campaign focused on local risks. Of course even achieving this requires significant effort, again just ask the people living near the site of the Kalamazoo River spill. But all of this is at least possible, if not business as usual. Contrast that with the risks of climate change. Mitigating climate change (absent any huge advances in carbon capture and storage) requires us to slowdown fossil fuel extraction then stop and leave most of the remaining fossil fuels in the ground. And we have to do this is a frighteningly short amount of time. There is no way to reconcile climate mitigation with the building of a new pipeline. Likely this is why climate change was simply ruled outside the scope of the joint review panel that approved the Enbridge Northern Gateway Pipeline. Had they been forced to consider climate change, the result of the joint review panel could well have a rejection of the pipeline proposal. We need to talk about climate change, we need to keep talking about climate change until we are blue in the face, because as long as we neglect to talk about climate risks, climate policy to help mitigate those risks will continue elude us. Could not agree more Dan, and it’s so good to hear the words ‘climate change’ in a discussion of the proposed Enbridge pipline. I live in south-central British Columbia and have participted in a couple of CBC radio call in shows dealing with both the Enbridge/Tar sands and the other magic bullet being promoted by our current provincial government – LNT or Liquified Natural Gas. This involves the construction of pipelines and facilities in Kitimat on our west coast; facilities for liquifing the gas and port development for large LNT container ships. But not once, did I hear any talk of climate change or C02 emissions or the folly of building infrastructure that will tie us to fossil fuels for decades. I consider myself fairly well informed regarding climate change and to hear discussions of these projects where the words climate change just do not get mentioned is crazy-making. It would be somewhat reassuring if there were at least some lame sceptical misinformation presented or some government hack promoting the short term economic benefits so that there would be an opportunity for an exchange of information and a debunking of the usual yada yada…people could perhaps discover that its not just tin-foil hat style paranoia. But…nothing. It’s just not mentioned. It doesn’t exist. And of course, our scientists in Canada are on a short leash and not allowed to speak freely with the public. This is very frustrating and frightening. Excellent post Dan. You neatly summed up the points that are of concern to me on this issue. Building out the pipeline infrastructure would only lock us in to more and more fossil fuel combustion when we should be using our efforts to transition towards a renewable energy future. I find it curious how many people fail to see or acknowledge the big picture. An oil spill is something everyone can conceptualize as something tangible in space and time but as tragic as such an event would be it pales in comparison to the destruction that would be wrought by the extreme climate changes that would occur if we continue merrily down the path of increasing CO2 emissions. Perhaps it’s just a difficulty for the human mind to grasp the big picture, something seemingly abstract and unprecedented in our collective experience. It seems therefore that it is put into a little box somewhere off on an island and the small picture is featured front and centre. Anyway I hope you continue to hammer on this issue. As you suggest the government and the fossil fuel industry can pose many good arguments against the oil spill scenario but against climate science they have nothing. You’ve hit the nail right on the head there, Dan. It’s as if the big issue (CO2 emissions) is totally taboo, and only peripheral matters may be discussed. This blinkeredness affects the so-called environmentalists too, with Greenpeace’s Arctic Oil Exploration and Fracking campaigns misguidedly emphasising ‘local’ effects over the global one of continued emissions. Hard to find words strong enough, but it must be done. What has happened to our brains, that they no longer see 2 + 2 no matter how obvious it gets? I’m mostly with Dan on this one, but let me play devil’s advocate. Consider that the pipelines run through rural areas. Getting local opposition brewing is all about local impacts. In Texas, you can play on property rights for instance, though alas the southern leg of KXL is a done deal. But getting ranchers up in arms against big oil is no small feat, politically. Once they perceive that they are being taken advantage of, they may be in a better position to evaluate the global warming issue. The tradeoff here is between getting to a culture that understands that it has global responsibilities, versus stopping a particular development at a particular time. Unfortunately these objectives do not always line up perfectly. Consider for a moment if this pipeline isn’t built. All things being the same, wouldn’t we most likely just get oil from an alternate source that is likely to a) have more localized environmental risks like a spill than this proposed pipeline, b) consume more fossil fuels to extract and deliver than the proposed pipeline, and c) come from a less stable country that creates very different sorts of social risks. I am not saying that the article does not makes perfect sense (i.e., its not the spill that matters, its the overall CO2 generation that is the environmental issue we need to solve), but the problem is 2 dimensional – how do we use less oil AND get the oil we do use from politically stable countries using efficient technologies. The pipeline actually helps hugely with this 2nd dimension. My argument would be that we need to promote using less oil by making it more difficult, expensive, less profitable, etc for the countries who can flood the oil supply without regard for the 2nd dimension. Those of us capable of listening to reason while worrying about the bigger picture take your point. The problem is, when you build infrastructure it leads to more of the same. The tar sands monster has taken on a life of its own. Another problem, not mentioned much, is the massive health and ecosystem problems in the immediate vicinity. So being unable to stop the habitual enterprise of big industry and its slave governments, we’re stuck with trying to block the passes. It might not make sense in the most practical way, as you ably state, but it is necessary to do something, and nobody much is doing “something” in a meaningful way, except the public and private enterprise, against all odds, who continue to find more and better ways to deliver truly clean energy. There should be no surprises there, as every attempt is made to choke the best work, doing good to do well. The juggernaut of business as usual is rapidly moving us from dangerous to more dangerous. What so proudly we hail’d at the pipeline’s last gleaming? O’er the flame parts we watch’d, were so vioilently streaming? Gave proof through the night that our town wasn’t still there. O’er the land that we flee and the home that’s not there? Transcanada Gas Pipeline Explodes, Lights Up Sky.